Roof Coatings: A Viable Option? A question is commonly presented to roofing professionals and consultants by building owners and associations: Is a roof coating a viable option for our roof? The increasingly high expenditure associated with a re-roofing project in comparison to the fractional expense of a roof coating is the driving force behind this general inquiry by building owners and associations. Though there are certain limitations to be aware of, roof coatings can be useful in the maintenance of an existing roof system. Roof coatings are typically applied by a state licensed roofing contractor, who is trained and certified by the coating manufacturer for the application of their product on various roof systems. A roof coating is a fluid material consisting of solids and carrier, solvent- or water-based, which is delivered to the project in pails, drums, or totes. Despite the fact that a roof coating has similarities with waterproofing coatings, they are not the same in effect. In addition to the fluid-applied materials, a waterproofing system is reinforced throughout with a fiberglass or polyester mat and an aggregate (sand) layer. A roof coating is film formed to the roof surface to provide weathering protection for the original roof membrane, providing a sacrificial barrier intended to slow the aging effects of moisture, infrared (heat) rays, and ultraviolet (UV) radiation exposure. A roof coating consists of a base/primer coat to assist with adhesion to the roof membrane and a UV-resistant top/finish coat, applied in one or two coats. An array of options are available in the marketplace, including polyurethane, acrylic, silicone, asphaltic, and aluminized coatings. A bond breaker tape, fiber-reinforced add mix, or embedded polyester or fiberglass is required at roof penetrations, metal seams, membrane laps, and areas of potential movement to prevent splitting, cracking, and premature failure of the coating (NRCA 2015). Sunscreen provides a basic analogy of the function of a roof coating. As sunscreen is applied, it leaves a residual layer of film over the surface of the skin—a sacrificial barrier to protect the underlying skin from the above UV exposure. It is a temporary measure to protect a system of greater importance to the entire structure. The manufacturers provide written directions for the individual user, which require the prescriptive method for reapplication of the product at a predetermined interval of time to maintain the level of protection. Under certain conditions, the product must be reapplied more often, due to instances of submersion in water. A roof coating is performing the same task on the roof as the sunscreen is to skin; the roof coating is shielding the roof membrane, which is the system of greater importance shielding the entire building from the elements (Oxford 2016). A roof coating is temporary by its nature and requires continual maintenance to sustain the level of performance which it was intended to meet. 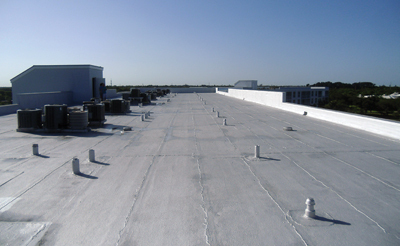 Submersion of acrylic and urethane-based roof coatings, resulting from insufficient positive drainage leaving standing water on the surface of the roof, accelerates weathering and breaks down these coatings. Adhesion loss between the roof coating and membrane is promoted by constant exposure to moisture, pinholes, or cracks in the coating and will result in premature failure. Silicone-based roof coatings have increased moisture exposure resistance for a higher price but are still prone to application issues and cracking. Coating manufacturers provide prescriptive methods for addressing submersion due to standing water, and in many cases, restrict the application of their products unless these conditions are corrected prior to application. Latent moisture found within the layers of the existing roof system due to previous water leakage will result in excessive vapor drive to the coating or down into the roof deck and interior building space. Correcting these issues at the roof assembly level prior to application of the coating is the best method (Ennis and Rokowski 2004) (NRCA 2015). A roof coating is meant to maintain the existing condition of the roof system and is not a replacement for a properly functioning roofing system. The application of a roof coating, with a guarantee by the manufacturer that the product will protect the roof for a period of ten years, does not guarantee that the roof which it is covering will last ten more years. Nor does the application of this coating reverse the clock ten years on the roof system to which it was applied. Applying a roof coating will never turn a 20-year-old roof into a 10-year-old roof, with ten years remaining useful life. The apparent warra-nty coverage furnished by the coating manufacturers tends to be a sales tool. 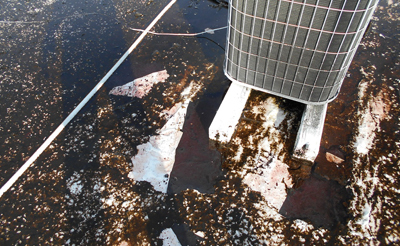 In cases of premature roof coating failures, the warranty’s terms and conditions greatly limit liability for the coating manufacturer to a simple guarantee that the product furnished was a roof coating and will remain a roof coating until the end of its useful life. Photographic documentation of the entire application, including records of the applied wet millage and product batch numbers, by the applicator and verified by a third-party, is necessary if a building owner or association is expecting the coating manufacturer to honor their warranty in cases of premature failure (NRCA 2015). All roofs are not suitable for a roof coating. A roof must be able to perform and function on its own without the additional attributes of the roof coating. If the structural integrity and mechanical properties of the roof assembly are compromised or its layers are saturated with moisture, the system should be removed and replaced with a properly designed and code compliant system. An existing roof system should be able to meet the wind uplift pressure applicable to it, and at the very minimum, those specific to the time of its permitting and installation. ASTM International and the American National Standards Institute have published testing methods that can be performed in the field to determine an existing roof’s mechanical uplift resistance, moisture content, and adhesion compatibly with a coating to the prepared roof surface. It is important to perform the necessary due diligence prior to making any decision (Kirn and Leonard 2007) (NRCA 2015). The application of a roof coating to a system that is at the end of or past its useful life can potentially conceal performance issues and worsening conditions. 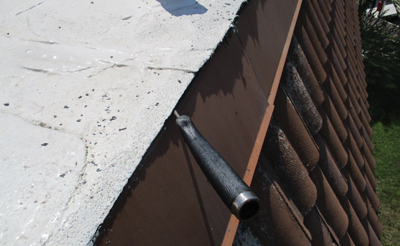 Primarily, roofing systems rely on either a mechanical fastener (i.e., nail, screw, etc.) or adhesives (hot or cold process asphalt, urethane, etc.) to keep the system attached to the structure and hopefully remain attached through the expected useful service life. Roof performance is downward sloping; as roofs age, they do not perform to the same level as when they were initially installed. The ability of the coating to mitigate leaks will be of little use if a gust of wind peals away the roof, coating and all (NRCA 2015). Moisture is constantly exchanged through the building and roof assembly. In certain climate regions, a roof coating may present a whole new issue. A roof coating lowers the temperature of the roof membrane, which is known to extend the life of the roof; however, this may not allow for the roof system to heat up enough to create downward drying. The temperature within the layers of a roof system change, either increasing or decreasing as you move from the deck to the exterior membrane surface. In existing roof assemblies, especially those with previously dark color membranes, the roof coating may remove the only drying mechanism the roof previously had and create a place for water vapor to change into a liquid. Water vapor changes from gas to liquid when it reaches dew point temperature, which can be below the roof membrane, within the insulation layers, or at the deck. If the vapor drive within the roof system was previously removed by the downward drying and is stopped by the roof coating, this moisture will accumulate in the roof system, trapped by the coating, and may show up on the building interior as a leak; but in fact, it is not (Mellot and Diamond 2015). The application of a roof coating is a preventative maintenance measure to reduce exposure to heat, UV radiation, and moisture and is intended to extend the potential service life of the entire roof system. It is not a replacement for a properly functioning roofing assembly. No expectation should be expressed or implied that with a roof coating you can restore a failing roof system. Roof coatings can be misused or misrepresented as a new roof, a cover, or a fix-all, and as a viable solution for a failed leaking roof. A roof coating is only as good as the roofing system it is protecting. 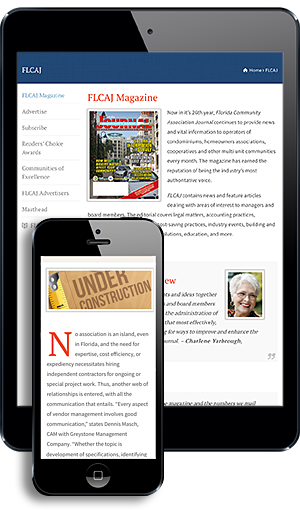 The author recommends contacting a professional engineer with a background in roof coating applications or a registered roofing consultant for a third-party, nonbiased opinion prior to any roof coating application. Ennis, T. and Rokowski, J. (September, 2004). Elastomeric Acrylic Roof Coatings for EPDM Roofing. Interface, 22–25. Kirn, B. and Leonard, J. (September, 2007). What Roof Consultants Need to Know About Field-Applied Roof Coatings. Interface, 28–32. Mellot, J. W. and Diamond, T. G. (July, 2015). Overcoming Vapor Drive Issues in Cool Roofing. Interface, 18–24. NRCA (2015). NRCA Guidelines for Roof Coatings. Rosemont, IL: National Roofing Contractors Association. Project Manager at Delta Engineering & Inspection Inc.
Lance Manson is a Project Manager at Delta Engineering & Inspection Inc. As a well-respected expert in the roofing industry, he leads many of Delta’s roofing and building envelope projects. With comprehensive knowledge of a wide variety of roofing systems, he specializes in roofing assessments, moisture evaluations, specification of roofing systems and repairs, contract administration, and inspection services during construction. Manson is also a certified Level I Thermographer and is skilled in providing non-destructive testing, including infrared and moisture scans of roofing systems and the building envelope. For more information, e-mail lmanson@delta-engineers.com, call (941) 727-2600, or visit www.delta-engineers.com.